The twist is in the sauce! 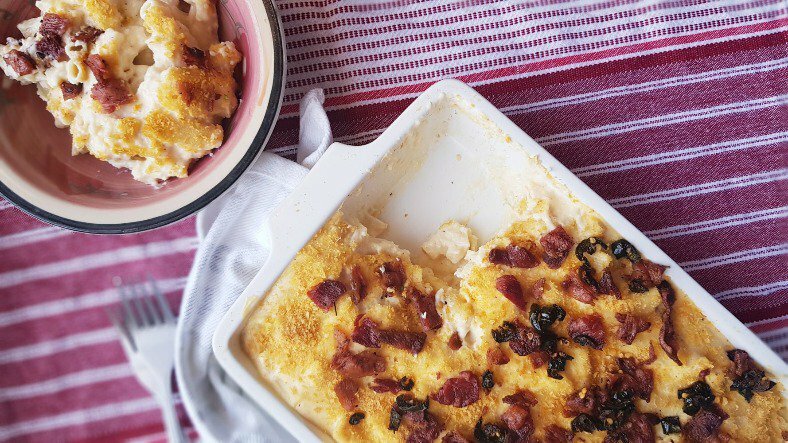 Food blogger Landi Govender is sharing her delicious recipe for a Jalapeno Popper Mac & Cheese dish that has a surprising twist. "The twist is hidden in the sauce. I’ve added pureed cauliflower! Don’t knock it just yet, adding cauliflower to this luscious cheese sauce makes it a whole lot creamier," she says. The American-inspired dish will certainly take your average mac 'n cheese recipe to the next level. 500g macaroni, boiled in salted water and drained. 2. Stir in the flour and cook for 2-3 minutes. 3. Take the pan off the heat and gradually stir in the milk to get a smooth sauce. Return to the heat and, stirring all the time, bring to the boil. 4. Simmer gently for 8–10 minutes and season with salt, pepper, paprika and Italian herbs. 5. Stir in cheese and allow to melt. Don’t re-boil the sauce or it will become stringy. 6. Add the steamed cauliflower to the cheese sauce and using a hand blender, blend till smooth. 7. Add the sauce to the cooked pasta and mix until coated. Scoop into a greased casserole. Image and recipe courtesy of The Tocka Blog.